A bullet fired on Earth travels 2,700 miles per hour and can do damage for up to 1,000 yards before it stops. A loose bolt in space hits at 17,000 miles per hour, goes through a spacecraft and keeps going. It's one office's job to make sure such a catastrophe doesn't happen. One of the Air Force Space Command Space Safety Office's missions is to keep satellites away from the more than 9,000 pieces of space debris and dead satellites flying around the Earth. 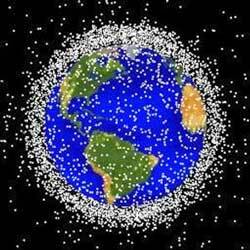 If they fail, space assets worth millions join the belt of worthless debris that surround the Earth. "Some areas of concern are collision avoidance, radio frequency interference, solar flares, Leonids [meteors], space debris and end-of-life 'safing' [making sure the satellite has a safe and passive afterlife in space]," said Lt. Col. Ed Browne, chief of space safety for Air Force Space Command. "Each one presents a huge risk to our space assets." Collision avoidance, also called COLA, is one of orbital safety's primary concerns. A collision can disrupt or destroy communications, navigation and weather information. While air traffic controllers must keep in radio contact with pilots to maintain safe separation, orbital safety officers must monitor the satellites, planning maneuvers through space riddled with thousands of objects. Satellites are not only a target for visible debris but also for invisible intruders. Radio frequency interference can block commands used to adjust a satellite's path from the ground. If it can't get commands telling it to get out of some debris' way, there could be a collision. The number of frequencies used is limited. Satellites at that distance from Earth's perspective are grouped closely together such as on the geostationary belt, which increases the need to maintain RFI-free communications. Space weather, such as an intense flurry of solar flares erupting on a cycle of every 11 years (known as Solar Max), can also damage satellites orbiting the Earth. Browne said satellite operations have statistically seen greater losses of satellites during that time. Another cyclic threat to orbiting space assets is meteor showers, such as the Leonids that occur every year in mid-November. "The risk associated with each threat seems to go in cycles," said Browne. "Each one becomes widely known at different times. When Leonids was in the news, it was a great exercise for satellite operations and orbital safety because everyone in satellite ops looked at this, planned for it and started doing risk assessments as to what should be done and what could happen to our satellites. They really started to think ahead and think how to prevent a loss. Today, people are doing the same thing with solar flares." Satellites aren't the only space travelers protected. COLA also keeps manned spacecraft safe. NASA's Debris Quarterly magazine tracks the maneuvers made by the new International Space Station and space shuttle to avoid space debris, said Browne. Orbital safety officers also make sure that once a satellite dies, it's safely placed in a graveyard that doesn't interfere with live satellites. Once the useful life of a satellite has come to an end, which is usually due to running out of station-keeping or attitude control propellant or due to degraded components, the satellite can become a hazard to other operational satellites. This hazard can be minimized by moving the satellite to a seldom-used orbit, referred to as a "graveyard" orbit, or re-entered and burned up in the atmosphere if it is in a low orbit, as was done with Mir, the aging Russian space station that re-entered the atmosphere in March. Orbital safety can minimize the potential hazards of a satellite at the end of its life by venting any pressurized tanks, to make safe any remaining pyrotechnic devices and to turn off transmitters. Orbital safety begins its work in the satellite's cradle and ends with the graveyard. They are there during the design phase to minimize the generation of debris during the satellite's life and minimize its vulnerabilities to natural and manmade hazards. Air Force space operations squadrons, which operate satellites, are required to have an orbital safety program headed by an orbital safety officer. In AFSPC, squadrons in the 21st and 50th Space Wings at Peterson and Schriever AFBs, Colo., maintain programs that oversee collision avoidance, review safety procedures and limit space debris. At a recent orbital safety summit, more than 40 safety members from AFSPC and Headquarters U.S. Air Force discussed orbital safety, its mission and how the program is evolving. "Due to the importance of current and future military operations and on-orbit assets, operations crews, maintainers and monitors must have an active and engaging safety program to protect space assets," said Maj. Paul Mejasich, the chief of orbital safety for the Air Force Safety Center at the Pentagon. "A robust Air Force space program requires a proactive safety program which can identify and mitigate space hazards; prevent mishaps during development, testing, evaluation, and space operations; and enhance the growing safe use of space products and tools by the joint warfighter." In addition to battling space debris and solar flares, orbital safety experts maintain an engineering database of lessons learned from previous situations, track the laser clearing house to ensure a clear path for any radiated lasers, and conduct launch and early orbit rehearsals to anticipate possible mishaps. If there is a mishap, an investigation is conducted to determine the cause so future mishaps are prevented. This is a challenging task, since hardware typically can't be recovered once in orbit. Preserving telemetry and other data such as factory build and test data is a critical component in determining the cause of an on-orbit mishap. In the time it took to read this article, thousands of objects orbiting up to 22,000 miles above the Earth passed overhead. Orbital safety officers made sure they flew by each other without incident.